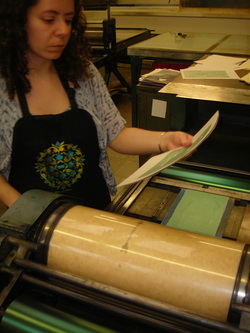 Rachel Fish earned her BFA at Oregon College of Art and Craft, where she studied printmaking, bookbinding and paper-making. Text is the major element connecting her work. Her process and aesthetic are informed by an affinity for letterpress-printing and traditional East Asian techniques. She is also passionate about guiding young people to find their own creative voice, which she does through teaching and volunteer work. She lives in Portland, Oregon. My work runs along two conceptual veins; deeply personal and sociopolitical, both of which share my desire to inspire compassion. By sharing deeply personal experience I touch on the universal emotions that connect us. This idea of interconnection is very important to me and leads into my more political work. It is my intention to use art as a catalyst to practice compassion and my hope that by sharing that experience with my viewer I will inspire compassionate thought in others. I feel the "book" has a unique capacity to communicate on an intimate level, in part because it demands to be handled, one on one, by the viewer.